The English Department held its first Graduate Showcase on May 7, 2018. Proposed as an opportunity to give graduate students a platform on which to share current research, presenters and audience members alike received the event with great enthusiasm. Split into two sessions, eight graduate students presented or pre-circulated working conference papers and forthcoming dissertation chapters. In addition to developing their presentation skills, presenters also received questions and feedback on their research from fellow graduate students and faculty. 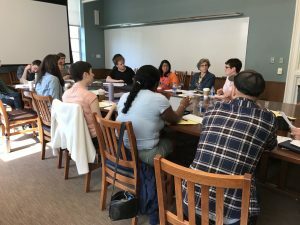 In keeping with its commitment for the professionalization of graduate students, the English Department plans to make the Graduate Showcase an annual event.